We are Karen & Jack Cotton - we are retired and travel full-time living in our RV. We have "down-sized" from our regular home-a 34 ft motorhome to our 19-foot 1992 Roadtrek camping van, we call Beatrice. Why Beatrice? She was born in Ontario, Canada and the French meaning is "bringing joy". That's what we are hoping for during our 6-month journey North To Alaska! Took us several days to decide what was essential and a few comfort things to have along. I felt like a pioneer "throwing" out bulky items--except I took the little folding gas Coleman BBQ and left the Dutch Oven. We stayed 2 nights in Santa Barbara and are now in Paso Robles, CA. We are members of Harvest Hosts (harvesthosts.com) which is a network of wineries, farms and agri-tourism sites that invite self-contained RVers to visit and stay overnight for free! We are camped for the night at the Tobin James Cellars where we also happen to be members of their wine club. It is a nice large grassy field and as the sun sets we hear the crickets, frogs and owls. We have spent the last couple of days working on little issues in Beatrice, such as a loose passenger seat, the over-windshield cabinet dropping down while driving and learning to put everything in its place! Tomorrow we will do some wine tasting at some of the over 200 wineries in the area. We made a quick detour to Las Vegas for an RV Rally. This is a great place to see just about everything and everyone! Street artists, brides, drunks, showgirls and of course-Elvis. He lives in Vegas! We leave tomorrow and start heading north--and we made our reservations for Denali National Park in Alaska to camp at Teklanika Campground. Today is the beginning of National Park Week (April 18-26) so we wanted to visit a Park along our route. We stopped along US 95 between Las Vegas and Reno, NV near the eastern entrance to Death Valley National Park and in the only part of the park that is in Nevada. Rhyolite Ghost Town in this eastern tip of Death Valley is all that remains of a once booming 1906 gold-mining town founded by the colorful prospector “Shorty” Harris. 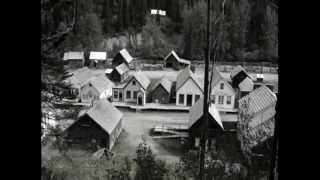 The town went from over 10,000 crazed 49ers complete with a school for 250 children, the Alaska Glacier Ice Cream Parlor, a miner’s union hospital and electricity to obscurity in 10 short years. Nearby is the equally unique Goldwell Open Air Museum. 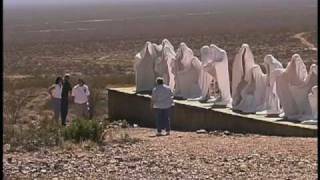 This 15-acre outdoor sculpture park began in 1984 when a Belgian artist, Albert Szukalski chose the dry, desolate desert to create his ghostly version of Da Vinci’s “Last Supper”. Not lost on us was the fact that his figures are draped in white “cloth” to look like ghosts (reflective of the nearby ghost town?). Other sculptures include the Ghost Rider (holding his bicycle), Lady Desert: The Venus of Nevada (classical Greek that looks like giant Lego blocks), Icara (the ample bottomed female with arms spread like wings) and our favorite “A Tribute to Shorty Harris” and his hopeful companion-a penguin (reflecting the never-ending optimism of miners). Further up Hwy 95 we drove through several small typical desert communities including semi-ghost town Goldfield, pop. 268, with its several shops and museums that would delight the junktique photographer. As we drove through northern California, we camped on the eastern side of Mt. Lassen in the Hat Creek Valley near Old Station. At the time there were only two campgrounds open due to the massive windstorm that ripped through the valley wreaking havoc in the campgrounds last February. Hundreds of uprooted trees crashed to the ground, roads were damaged, and many trees were left precariously leaning. We were lucky to find the remote and peaceful Rocky campground open because it didn’t sustain any damage. The USFS crews were working hard to get the campgrounds accessible for the opening weekend of fishing season but with limited USFS budgets the progress is slow. The next seven days we were in Salem, Oregon visiting with our son and family-and reconnecting with our 2 ½ year old grandson. He enjoyed climbing in and around our RoadTrek RV while his daddy and Jack did some minor work on “Beatrice”-installing a new radio (hmm, will we miss the cassette? ), fixing the passenger seat and replacing the sewer valve-yea! We are geocachers (learn at www.geocaching.com) and after departing Salem we made a detour just west of Portland, Oregon to help a trackable “travel bug” from the Czech Republic complete its mission to visit the headquarters of Nike Inc. Unfortunately that put us in “rush hour” and it took nearly 2 hours to get across the city and into the Columbia Gorge. We found a fantastic campground at the Port of Cascade Locks Marine Park right on the Columbia River (and next to a brewery) with green lawns, showers and walking trails. Although it was a little more than our usual nightly budget (free - $10), the “dry” camping at $18 was worth it because of the location. Great night for us. Our first stop was the Oregon Trail Interpretive Center in eastern Oregon outside Baker (http://www.blm.gov/or/oregontrail/#) which is nearing the end of the 2,200 mile wagon train exoduses of the 1840s to 1860s. Here we could walk along the actual wagon ruts that are still visible across the Virtue Flats. Oregon Trail ruts resemble a swale of slightly packed earth formed by the wagons and the oxen, rather than the more familiar set of parallel tracks typically made by automobiles. The Center hosts changing events, life-size displays and miles of walking trails. This is a great stop to learn more about this largest migration in American history. Traveling further east we passed Farewell Bend which was the last stopping spot for the emigrants along the Snake River. Given the name, apparently they were very pleased to be leaving that river after crossing it several times over 300 miles but they didn’t know what was up ahead. Because of the difficult weather and thick timber the Blue Mountains of eastern Oregon would be some of the worse mountains they encountered. We then crossed into Idaho following the Oregon Trail where we learned there had been two different locations of Fort Boise-the first built by the British Hudson Bay Company and the second by the U.S. Government. But neither remain. Our final visit was to Idaho City established in the 1860s and once the largest gold-mining town in the Pacific Northwest. The original Idaho City Hotel still rents rooms. We camped at two very nice USFS campgrounds-Grayback Gulch near Idaho City and Hot Springs near Banks, Idaho. Oh yes, we enjoyed the natural hot pools alongside the South Fork Payette River. We lived in Coeur d'Alene for 30 years overlooking the lake and it was nice to come back for a short visit. While there are numerous small lakes in northern Idaho, the three largest glacier-fed lakes are Coeur d’Alene, Pend Oreille and Priest Lakes. Lake Coeur d’Alene (pronounced core-duh-lane) means “heart of the awl” and was so named for the perceived shrewdness of the trading skills exhibited by the Coeur d’Alene Indians. Bald Eagles flock here around Christmas to eat the dying Kokanee Salmon after they have finished spawning. Between 1880 and 1920 there were more steamboats and paddle wheelers plying the waters of Coeur d’Alene than any other lake west of the Great Lakes. Unfortunately there are none left and most either burned or sunk when they were no longer needed. The lake is a great place for scuba divers to explore the old paddlewheels that have settled into the bottom of the lake. Lake Pend Oreille (pronounced pond-o-ray) is the next lake northward and has 143 miles of shoreline with a depth of 1170 feet! Farragut State Park that sits at the southern tip of the lake was once the world’s second largest naval training station and still has a U.S. Naval acoustic underwater submarine research base. The most northern lake is Priest Lake and is the most rural of the three with the lots of public land surrounding the lake. There are numerous private, state and federal campgrounds with access to the lake. These three lakes are beautiful and draw thousands of people to fish, boat, water ski, camp and play on the beaches. Tomorrow we cross the border into Canada and start our journey along the Rocky Mountain route in Alberta, Canada. We were prepared for the worst- eating up all our fresh fruits, vegetables and meat, keeping to the individual limits of wine, (no weapons or animals-we don't have either) and anticipating a long wait while border patrol officials boarded and searched our RV. Of course this is what we read and it was far from our experience. There was a short line of vehicles at the Eastport crossing in Idaho but in total it was 10 minutes and three standard questions. Happily we entered Canada ready to explore new areas we haven't seen. The first night we stopped at Frank Slide, site of the most deadly rock slide in North America. Early one morning in 1903, 82 million tons of limestone rock slid down Turtle Mountain destroying part of the small mining town and burying about 100 people. This is coal country and the hardy miners just moved the remaining town buildings about a 1/4 mile west. Next stop was “Head-Smashed-In” Buffalo Jump World Heritage Site. We try to visit UNESCO World Heritage sites as they are always so special. This Buffalo Jump is probably the oldest, largest and best preserved of the Western Plains and was used as far back as 4,000BC. It was very windy and cold but we just had to walk out to peer over the 10 meter cliff. Interestingly there was about 1000 years during this period that the site was abandoned-why? We are driving north on the Cowboy Trail (Hwy 22), which parallels Alberta Hwy 2, stopping at several towns and marveling at the impressive ranch spreads, beautiful palomino horses and boreal forests (stands of conifers and aspen trees interspersed with wetlands). We are watching for bison and moose but have been curious about two different signs for deer-one sort of just walking and the other leaping. In fact someone had attached black wings on the sign to warn us of flying deer! And of course we stopped in Cochrane for ice cream at the infamous MacKay’s – only about a 30 minute wait in line-but yum-Nanaimo Bar, Saskatoon Berry and Haskap Berry ice cream cones. We backtracked a bit to visit the Rocky Mountain House Historic Park where evidence of four fur trading forts were, including the 1799 Hudson Bay and the Northwest Trading Company Forts. Coming from Northern Idaho we have learned about David Thompson exploring in the Northwest but this was the actual Fort where he and his wife lived and had the first of 13 children! The campground at the Site looked to be very good and offered great history just a short stroll down the trail. Onward west towards British Columbia we stopped to admire the giant 25 foot tall beaver at Beaverlodge. We made our way across the border into British Columbia getting ever closer to Mile “0” of the Alaskan Highway in Dawson Creek. Just outside the city limits, in a construction zone, we were the recipients of a flying pebble and suffered our first rock chip in the windshield-and we weren’t even on the Alaskan Highway! The ever helpful staff at the Visitor Center called a shop who could get it fixed within 30 minutes and we were on our way. After our obligatory photos of Mile “0” beginning of the Alaskan Highway we visited the Alaska House to learn about the construction of the highway which has given us lots of thought as we drive the highway, especially the bridges! When we left Dawson Creek, we took the side road to drive part of the original Alaska Highway that took us over the 190 foot wooden Kiskatinaw River Bridge. This was the first curved bridge (9 degree turn) built in Canada and the only one left of those constructed in the summer of 1942. Fortunately we were alone on the bridge and could stop to walk the bridge and even find a Geocache under it. Historical Mile 300 of the Alaskan Highway found us in Fort Nelson, BC at the wonderful Visitor Center with Wi-Fi, helpful staff, and comfortable tables. Jack purchased a sweatshirt with the Northern Rockies Regional logo. Across the street we visited the Heritage Museum and saw lots of STUFF and THINGS and ITEMS and MOMENTOS from the first 70 years of the Alaska Highway that has been compiled by volunteer curator, Marl. Owen, a local high school student, gave us an interesting tour of the pioneer outbuildings complete with tidbits and stories about the vehicles, machinery, buildings and people, including an actual Hudson Bay house that was used a real estate enticement. Well worth the stop. Just north of Fort Nelson we turned off on Hwy 77 and spent the night “boondocking” at Beaver Lake. Serene location but even the beavers were hiding from the huge mosquitos. The next day we drove into the Northwest Territories to the tiny hamlet of Fort Liard. Even in such a small village, we were able to purchase gas at a reasonable price, log on to Wi-Fi outside the library and marvel at the handmade birch and porcupine quill items made by the local the Acho Dene Native people at the visitor center. Karen bought a pair of beaded moose hide earrings. Of course we grabbed a geocache to add to our expanding list of countries (22 so far). This was the best day yet for sighting wildlife-four black bear, bison and a snowshoe rabbit (brown body with legs still white) all in the NW Territories and another bear in B.C. That night we were truly welcomed by Bob and Rita, campground hosts at the Tetsa River Campground Regional Park. This was the first time we signed a guest book for a campground and were given little “welcome” gifts! The next morning we saw the signs along the highway and just had to stop at the “cinnamon bun center of the galactic cluster” in Tetsa River—well, they were very tasty and another must stop for travelers. But be forewarned, unless you want to be added to Gail’s humorous customer anecdotes, decide whether you want a whole bun or will share one BEFORE you enter the restaurant! Up the highway we stopped at Toad River for gas and to use the internet at just a $1.00 which was a good deal (we are anxiously waiting to hear about the birth of a new grandbaby!). Suddenly the door flew open and a man entered the store telling us to come see the moose who was trotting (?) in front of the store and toward the school. No worries, with only 9 children in the grade 1-12 school they can quickly usher the students into the buildings if the animals get too close. A short distance up the road we stopped to take a short hike at the Tetsa River Bridge #1 that would take us through the woods and down to the river edge. We were the only people around and since we forgot our bear bell in the rig and then saw a wildlife camera mounted on a tree we turned around. Back on the highway within one mile of that trail we saw a large bull moose no more than feet from our car and a black bear. Somehow we felt better about “chickening out” on the hike. Although this is a frequent area for Stone Sheep we saw only two perched high up on the rocks. Stone Sheep, a subspecies of the far north mountain Dall Sheep, are indigenous to the mountains of northern B.C. and southern Yukon and look a bit like mountain goats. One ram had very large curved horns and must have been really high on the A-list of males. We settled in for two lazy days at Muncho Lake just because it was just so beautiful at the foot of the snow covered Rockies and the weather was so warm. The lake however was very cold but these two dusty trail riders jumped quickly in and out just to feel refreshed. On one of our walks we spotted small patches of tiny lemon yellow flowers that we were informed were “Lady Fingers” and were lucky to see them. We finished this three day stretch with a day at the Liard Hot Springs. What a gorgeous spot-the water is hot and clear surrounded by ferns and birch trees. It’s a great place to chat with other travelers and compare “where are you from” and “where are you going?” We met people going to and coming from Alaska. And I’m sure there were many families just camping for the weekend. We have been expecting to see more Stone Sheep and the reintroduced Wood Buffalo along this stretch but no luck. We have seen lots of prints of moose, bison and maybe caribou but honestly we can only tell who makes the different prints when we see the accompanying droppings-moose is definitely different than the buffalo. We crossed the 60th Latitude and entered the Yukon Territories. This border is a straight line due to Canada and Russia dividing the territory along the latitude line by back in 1800. Things are referred to being “above the 60”. This country certainly gave us the feeling of WILD-we saw more animals within this 140 miles than inhabitants: 21 buffalo in several groups and 4 bears! Then we were again in a small town-Watson Lake which is famous for the Sign Post Forest, started by a lonely soldier in 1942. We looked for a sign that Karen and her family might have posted on a family trip back in 1962 but no luck. We did find a geocache hidden between the signs for the cities of Clayton and Savar. Driving the next 185 miles we didn’t see any animals. Perhaps they stay secluded when it rains too. Our next discovery was the village of Teslin, said to have the largest concentration of First Nation peoples of any Yukon city. We have been traveling early in the season and some of the museums, such as this Heritage Centre, are not charging yet. That’s a nice surprise. We really liked the five exceptionally fine hand carved poles representing each of the five Tlingit clans-Crow, Frog, Beaver, Wolf and Eagle that were outside. Centre. Klondike here we come! We have now moved on to the part that brings the Yukon to memory for many of us-the gold rush to the Klondike. We took a side trip to the town of Carcross which is intricately connected to the famous Chilkoot Trail where thousands of men and women trekked uphill and overland on the way to the Dawson City. This quiet village suddenly came alive when the tourist train from Skagway and several big tour buses from the cruise ships arrived. The local shops have a concentrated 2 hours to convince the people to make their purchases. We checked in with the visitor center for a spot to boondock for the night and were given a couple of suggestions along with a hike. We camped near the lake in what looked like an old gravel parking lot. Apparently it was the town site of an old abandoned mining town. Nothing left now but a good spot for us to camp. We met a lady with a butterfly net and she told us about some unique butterflies that are only found in certain spots in the Yukon. As we were leaving the next morning a big cow moose crossed right in front of us and had been only a few hundred yards from our camping spot! Once they are in the bushes you could be 20 feet away and not see them. Whitehorse was a surprise-quite a large city with everything you’d want. We camped two nights at Wallyworld (in the RV community that is Walmart). Lots of great museums to explore including learning about Beringia-that is the area of the Yukon that was not covered during the last ice age and had vegetation and animals such as the Muskox and Mastadons. We even got to hold a real mastodon tooth! It is pretty big. Another side trip up the highway took us to Mayo and Keno that were gold and silver mining towns. This was interesting because having lived near Kellogg, Idaho (which was huge for silver mining too) we learned that ore from these towns may have actually been shipped all the way to the smelters in Kellogg back in the early 1900’s. The tiny village of Keno-60 miles up the mountain on a dirt road-has a population about 20. It was the 4th largest silver mining area (corporate mining) in the world and at its peak the population was several thousand. It was so odd to see photographs from the 1960’s that could have been Anytown, USA or Canada that is now a virtual ghost town! Yukon Government provides a very good mining museum in both Keno and Mayo. We camped at a free campground right on the bank of the river in the town of Mayo. Another great side trip up the Dempster Highway. We camped overnight at the Tombstone Government Campground right on the river and explored the Tombstone Visitor Center. We really wanted to drive up to the tundra area but the next morning we woke up to snow! Pretty cold for us from south of the 60. We drove a couple of miles beyond the campground above the tree line and it was absolutely beautiful with the new snow on the mountains and the rivers. We saw a couple of more Ptarmigans-they don’t move very fast and tend to stand in one position thinking they won’t be seen? We also found several piles of white feathers in the bushes-from the ones that didn’t get away. Along the way we saw a cinnamon (colored) black bear! That is quite unusual and we so surprised we only grabbed a photo as it went back into the woods-you have to take our word for this. 1896 Gold Discovered and the rush begins – it continues today but the Sourdoughs and Cheechakos drive RVs and ride motorcycles many, however, still with backpacks and canoes. We drove back up to the Discovery Claim on Bonanza Creek where the first gold was found. One story was that Skookum Jim’s sister Kate Carmack was washing clothes in the creek when suddenly they were glittering. Gold was found and it spread up the mighty Yukon River. The lonely prospector hunched over his pan working his piece of the claim really only lasted a year or so before the huge corporate Dredge machines came in and began digging and destroying the creeks in the name of progress. Dredge No. 4 still remains today and it looks like a huge boat that moved ever so slowly up the creek spewing out the rocks and mud as tailings. As one of the Park Canada interpreters described Dawson City of then: “#1- We were rich, very rich, #2- We were far away from anywhere, very very far away, and #3- We were a community”. With a twinkle in his eye he said, “and today Dawson is the same, but the riches come from you, the tourists”. We spent 4 days taking some great guided tours and exploring on our own the many old buildings full of history and stories. Karen especially enjoyed the program called The Adventurous Life of Robert Service. We listened to readings of the Bard of the Yukon while seated in front of his actual cabin with the moose antlers over the door. Jack’s favorite was the evening walk called “Strange Things Done in the Midnight Sun” with stories of yesterday’s and even today’s quirky characters. We are nearing the summer solstice when the sun will never set. The many hours of daylight are very strange to us. Children still run and squeal in play outside at ten o’clock because they can. We sit by the fire late and hit the sack at midnight and it seems like late afternoon. Young people leave the campground for town in the evening when it’s light and return after the bars close at 2 o’clock in the morning and it is still light. The sun pinches through the cracks in our blackout curtains all night long. Darkness only comes when we close our eyes. We crossed the border at Poker Creek/Little Gold Creek (pop.3)-a joint customs facility on the Top Of The World Highway from Dawson City, YT. It was an 85 mile mountain rim run on hard packed dirt (and some bumpy spots) but fortunately it only showered or it could have been really muddy. Gorgeous views of the mighty Yukon and other rivers, mountains and trees for as far as you can see. Upon entering Alaska we have been 58 days on the road and traveled 6,500 miles. Beatrice (our ’92 Roadtrek camper van) is doing marvelous-bless her little 318 cu inch “heart”. Overnight at isolated Walker Fork BLM campground with only 3 other campers then on to Chicken, Alaska. Now there’s a unique wide spot in the road. There are three “towns” that each seem to be vying for the tourist: Downtown Chicken (owned by Susan) boasts the best homemade pies (which we tried! ), a liquor store, souvenir shop and café; Chicken Gold Camp (owned by Mike & Lou) with another nice gift shop (which we also supported), RV camping plus the large 1906 Pedro Dredge; and Historic/Original Town of Chicken (owned by Bronk) mini golf, mining, a couple of eateries and Trish’s schoolhouse. How all this happens with a total population of all three of about 23 (summer)-7 (winter) AND only hauled-in water, outhouses and generators. The only common building it seems is the tiny log cabin post office where a moose stopped to munch only 15 feet from us! In Tok, Alaska for the night where we had a curious chat with 4 young guys bicycling from Anchorage to Argentina! We suggested they stick close together and look like a really big moving monster when passing some of the buffalo, moose and bear we saw. After a day of household chores in Tok (mail, market, gas, post cards to grandkids, liquor store, fishing license & tackle) we moved on up the road. Being a couple of weeks ahead of our planned schedule, we opted to go down to Valdez first then up to Fairbanks so we backtracked 30 miles to the Tok Cutoff. But first, check the weather—Yikes! Snow in Valdez tomorrow. Change of plans again, go to Fairbanks where weather forecast better. So we covered that 30 miles again and stopped to camp along a lovely little lake. In the morning Karen tried our portable shower which runs on 9 volt or batteries. Not too bad and at least hair got washed. Good thing no one came (ahem). Across the lake we watched a cow moose with two baby calves relaxing among the foliage. Maybe they were the same family we saw yesterday trying to cross a fast flowing river. I keep forgetting we have electricity and can turn on a light! We are camping at the Tanana Valley Campground which is a “regular” campground with trees, dirt sites and fire rings but right in the city! And it would be even better if the road wasn’t closed to the west for construction. The weather is finally sunny and warm which allows us to leisurely walk through the historic downtown along the Chena River finding a few geocaches along the way. We have been enjoying museums, the superb visitor center, and even a local brewery. One of the great walking areas is the Creamers Field Wildlife Refuge where we saw the large Sand Crane birds for the first time. Have to admit they are so large that as we drove in from a distance we wondered if they were wild turkeys or some kind of small animal! The birds in the field are the young birds that are not ready to migrate to Siberia for the summer (from wintering as far away as south Texas) and take advantage of the wetlands of the refuge. The birds are naturally a grey color with a crimson crown but they “paint” their feathers with the brownish/red mud so they look much darker. They seem to have to flap their huge wings to help hop through the mud. We don’t eat out much (saving money) but we did try The Crepery which was very good! Karen had the pear/brie and Jack the cranberry/brie crepes. On our last day we spent 3 ½ hours at the University of Alaska-Fairbanks Museum. Upon entering the suggestion was about 4 hours so we knew there was a lot to see and absorb. We liked the cultural/geographical displays such as the whaling exhibit and learning about the Inuit people who were interned during WWII. Upstairs, even though we were tired and on overload, we could miss the Alaskan art-wonderful and often surprising! The Arctic Circle is a destination for many, especially as the summer solstice nears. There is only one highway and it is mostly dirt, gravel and the few parts that have been paved are generally worse with potholes, frost heaves or in the process of being repaired. Apparently it is so difficult and expensive to maintain and with only a few months of construction weather, the road becomes quite a patchwork. Our favorite quote from The Milepost Book, "the Dalton Highway is Alaska’s most remote, dangerous and challenging roads.” We drove about 250 miles (about half of the entire Dalton Highway) and crossing the Arctic Circle along the way. As we turned off the highway it was a bit anticlimactic but we of course needed to stop for a photo and to find a geocache. We spent 4 days staying in primitive spots along the creeks and remote "dry" BLM campgrounds. Jack was a little hesitant about putting Beatrice through this torture, but she did great! Of course driving 25-40 mph is the best way to avoid problems. One of our first stops was the Arctic Circle Trading Post where we met the affable owner Joe and his neighbor Pete and talked about everything from Texas to social work to the highway! Joe, Nancy and their 23 children (18 of whome were adopted) built their 11-bedroom homestead and the trading post to great visitors on their journey north. The scenery, views and unique landscapes were great. We especially were fascinated with the arctic tundra and what can grow in that very limited soil and climate! We were also ever curious with the various "characters" we came across on the highway, including walkers to the Arctic Circle to catch the Solstice, bicyclists from Japan, motorcyclists riding from sea-to-sea (Arctic Ocean to Key West, Florida) and huge safari four-wheel RVs. By far our favorite spot to explore was the small village of Wiseman (pop. 16) just north of Coldfoot. This hamlet was established by gold miners in 1905 and has maintained a population ever since. We met Heidi, a part-time staff with the National Park Service who gave a great presentation about living year-round "above the Arctic". Her family has lived in Wiseman for 3 generations and continue to trap, hunt, pick berries and grow vegetables to get by in the winter. In addition her family provides unique services to the tourists such as viewing of the Midnight Sun and Winter Aurora and historical renditions of the town. Our final destination was the surpise-around-the-corner view of Sukakpak Mountain. It is said that this mountain marked a traditional boundary between Eskimo and Athabascan Indian territories. They call this “Alaska’s Switzerland”—snow covered mountains, glaciers and ice covered water! Add some fishing boats, a harbor boardwalk and Alaskan sea and land wildlife and you’ve got Valdez. We have spent five days here and it is lovely. Wednesday broke with beautiful sunshine and clear skies beckoning us to our glacier wildlife cruise aboard the LuLu-Belle Glacier Wildlife Tour. Unlike many tours, Captain Fred is not limited to a time schedule so can spend that extra 9 minutes waiting for the humpback whale to resurface. In total we saw 4 humpback and 1 fin whale, Dall porpoise, numerous otters, hundreds of Steller sea lions, horned puffins, bald eagles, seals, and even mountain goats right down on the rocky shoreline. The climax of the trip was making our way through floating ice and small ice bergs, often nudging them out of the way to come upon the face of the mighty Columbia Glacier. We floated gently a ¼ mile off the face of the glacier for over an hour anxiously waiting the cracking and booming that precedes the calving of the ice. Sometimes small chips or pebbles of ice fall and other times huge sections of the face. When that happens it hits the water with a huge splash that looks like an explosion then ripples the water shifting the landscape of bergs. This was a remarkable experience and one we won’t forget. But two days later we took to the sea again to fish for the popular halibut on the Misty Isle boat. This morning it was overcast, raining and forecast with big winds and waves. Wondering if we should go through with it and chance getting seasick or not catching much fish, we plunged onward. This time we were on a 40 foot all aluminum boat with a total of 8 people fishing. We caught four Halibut ranging from 29-34 inches, which weigh 10-15 pounds. We did see people on the dock that evening with halibut weighing well over 100 lbs. Sure it would have been neat to catch on of those, but as it was we could only cram 2/3 of our fish in Beatrice’s little freezer and had to ship 10 lbs to our kids in Oregon. We are slowly making our way towards Denali National Park and thought we’d share some tidbits that we found interesting and new to us (probably not to Alaskans though…) We took another side trip to the small town of Chitina, pop. 126, that sits on the edge of the Copper River and the Wrangell-St. Elias National Park and is popular for fishing for the famous Copper River Salmon. We went to see the dip-netting for the salmon but were not able to get to the banks of the river where they were because it required 4 x 4 vehicles. It can be difficult and dangerous as the shoreline is very steep, the river is fast and they often need to tie themselves off to trees. The large nets (about 4-5 feet in diameter) are held by hand, dipped, until the salmon swim into the net. Then they are hauled hand-over-hand onto the shore. Later we stopped at Circle F Ranch that is successfully raising Tibetian Yaks for meat, yarn and fiber. We bought some of the meat and BBQ’d it as kabobs. It’s very lean, moist and “rich” tasting and even though we could only eat about 3-4 oz each, at $20 a pound, it probably won’t become a staple for us. We found a great boondocking campground about 50 miles west of Glenallen at the former Little Nelchina State Recreation Site. We like to find these campgrounds that are “abandoned” yet still have level spots usually right next to a lake or river…and are free! Traveling is such a great way to learn about odd facts such as FDR’s New Deal Matanuska Colony Plan in 1934 that relocated about 200 destitute Midwestern farmers to the fertile land around Palmer. These “Colonists” were given either 40 or 80 acre tracts of land to try to develop in the harsh conditions of Alaska. More than 60% of the original colonists left within a few years but there are still farms around. The Iditarod Trail Sled Dog Headquarters in Wasilla was fun! We got to hold tiny puppies which brought back memories for Karen who, with her family in 1962, brought home a husky pup from the Yukon Territories. And we got to try a dog cart ride pulled by dogs that are trained for the actual Iditarod race! We first camped at Riley Creek, the main campground at the entrance of Denali National Park, and toured the great Visitor Center. Then we moved on to camp for 4 nights at Teklanika campground which is 29 miles inside the park and once there we could not use our vehicle and only took the shuttle buses further into the park. It seemed pretty remote. The 90 mile road inside the park was built in 1938 and isn’t much different today! The first day we rode the bus Mt. McKinley was in view and it was spectacular! The anticipation rose each time the bus rounded a mountain to gain another sight of the mountain. The best view was at Eielson Visitor Center Over four days we rode shuttles each day getting off and on to walk several miles along the roadway and venture a little off into the tundra. During the four days we were there we were fortunate to see the “Big Five” – moose, caribou, Dall sheep, grizzly bear and wolf. This is a time that we really wanted a better camera with a huge lens! Four days in Seward and 5 days Homer - surrounded by Glaciers! In Homer we just relaxedout on the Spit, a 4.5 mile long, narrow piece of sand and gravel that juts out into the Kachemak Bay. We camped in the city campgrounds that line the shoreline at only $15.00/night. Our Roadtrek van size allowed us to camp in the tenting section that put us closer to the beach and away from the more packed RV campgrounds. It was lovely just watching out our doors at the otters, birds, boats and ships going by. On one of the windy and rainy days we passed several hours in the Alaska Islands & Ocean Visitor Center exploring the natural wonders of the Bay and learning about the largest seabird refuge in the world. A highlight was a cruise on the "Rainbow Connection" to Seldovia where were saw huge numbers of seabirds, whales and otters. Historical fishing towns, world-class records, commercial fleets, shore fishing, streams and rivers-it’s all here. We are taking the Marine Highway Ferry System and stopping at seven cities/islands to camp for a few days. Our first town was Haines which is the last town that can be reached by car before jumping on the ferry. Haines has some interesting spots such as the Hammer Museum which was more interesting than the name implies! I liked the tiny hammers that were used to break lumps of sugar candy. After a few days and good coffee/pastries we boarded the ferry at 5:30 pm arriving in Juneau at 10:00 pm. Since it was late and dark, we drove to the nearby USFS campground but were shocked when we discovered that they no longer accept payments on site and only take reservations by phone even when there were empty campsites. We learned later that both of the USFS campgrounds have gone to the reservation-only method and the campgrounds are often empty. It doesn’t seem to be a very user-friendly or effective method. In Juneau we met up with friends who we know from wintering in California and the highlight of Juneau was a full day fishing with Denny & Linda on their boat out in the Sound. The day dawned sunny and warm and provided us with a picture perfect day. We caught 3 Coho Salmon, 3 Sea Bass and a huge halibut weighing in at nearly 150 pounds! Jack had great fun fighting that monster for about 20 minutes using every bit of strength he had to land it. Just when he could see it coming up, it took off for a dive and he lost all his momentum! This was a very special day for us! A few days later we arrived in Sitka in the afternoon and immediately sensed we were in a town that was seeped in history of conflict, trade, religion and cultures. In the early 1800’s the Tlingit people and the Russian Orthodox had several battles over settlement eventually coming to an uneasy truce. Today much of Sitka is part of the National Park Service commemorating the heritage of the Tlingit and other Native Peoples with the famous Totem Poles and the Russian Orthodox experience with the Russian Bishop’s House. We were fortunate to watch one of the totem poles being taken down and moved to a covered area where one of the local artists will carve a replica. We visited both Petersburg on Mitkof Island and Wrangell on Wrangell Island by ferry and they have been some of our favorite island stops spending over a week camping, hiking, geocaching, watching for whales and meandering among the hundreds of fishing boats. We have camped every night for free in either the Forest Service, city campgrounds or just boondocking in the forest and ate many meals overlooking the Frederick Sound, glaciers and even floating ice! The Norwegian culture is not as predominate as it once was but there are still many tole-painted houses with colorful flower boxed windows. One of the largest canneries has an annual raffle to guess the number of cans of salmon that will be produced. We put in our guesses at around 12,812,000. We could be off by a few…. When the rain let up we were able to go for our daily hike over the muskeg on old wooden boardwalks. In Wrangell we took advantage of the many walking and hiking trails, again often on boardwalks through the forests and muskeg. Both of these towns were very friendly, and less impacted by the thousands of cruise visitors that other towns receive. On to Stewert, B.C. & Hyder, Alaska to see the bears in action at the famous Fish Creek Wildlife Observation Site. Here the black and brown grizzly bears fish for salmon in the shallow gravel river bed. Unfortunately after standing around for nearly 10 hours on the boardwalk overlooking the creek for two days and not seeing any bears, we decided to leave. This year numbers of Chum Salmon coming up the river to spawn have been high and some have suggested that the bears are able to catch the fish at different streams lower down. Who knows, but it was rather disappointing. We did see lots of salmon, gulls and some herons and the town of Hyder was fascinating with the closest U.S. bank being over 1,000 miles away and a school with only 10 children enrolled. There was no U.S. border checkpoint, but the Canadian border crossing was amazingly formal-like where did we go but the 2 miles into Hyder, Alaska and back into Canada? Driving east towards the geographic center of British Columbia it now feels like we are leaving the “wilderness” and moving in to more populated areas. We passed cattle ranches, logging trucks and RV caravans as we drove to connect back with the Cassiar and Yellowhead Highways. We sidetracked through several small Native villages by the names of Gitanyow, Gitwangak, Kitseguecla, and Kitwanga all of which had many old totems in their original locations representing stories from their Clans and families. One of the best tours was at the ‘Ksan Historical Village and Museum that was a replica Gitxsan Indian village. Here we got to go inside 3 buildings: a family home that would have housed 60 people, a spiritual lodge with items such as the Chief’s copper shields and bent-wood carved boxes and a storehouse with beautiful handmade costumes and carved masks still used in ceremonial dances. The young Native guide told us of her recent unusual, yet successful, ceremony performed by a medicine man who came from across Canada to cure her of a lingering malady. These are the unexpected joys of travel and being touched by cultural intimacies. (click on picture for video) We visited Barkerville, an authentic gold rush town from the 1860's that has over 130 original and replicated buildings. This town was named in honor of Billy Barker who first discovered gold in 1862 on Williams Creek and set off the Cariboo Gold Rush in British Columbia. There was so much to see and do that we easily filled the two days. The town offers tours, demonstrations, skits, activities and many special shows. We toured the Barkerville town site and Chinatown with costumed interpretive guides, watched the teacher in the schoolhouse, the "hanging judge" in the courtroom and the miner at the Cornwall Waterwheel. It was a great experience and highly recommended. We camped at the Government Hill campground within walking distance. We traveled our last few days in British Columbia, Canada down the old 1860’s Cariboo Wagon Road that was over 400 miles long and built to transport supplies, people and especially gold. This was a feat of engineering through exceptionally perilous canyon terrain. Continuing down the highway to the roadhouses or “Mile Houses”-100 Mile House, 103 Mile, 105 Mile and 108 Mile, supply towns such as Cache Creek and Lytton, and transportation hubs of Ashton and Clinton. These all developed to serve the gold rush that started with Billy Barker and his legendary gold strike on Williams Creek. We did some gold panning, geocaching and exploring through the rain until we crossed the border into the state of Washington. It was a little sad to realize our northern journey is nearing its end after 111 days and 9,561 miles. in Canada, Yukon and Alaska. We have been overwhelmed with the vastness of Alaska, the struggles of the First Nations and early homesteaders, the subtle change of the seasons and of course the bears! It’s been awesome. Would we go back? You bet 'cha.